At some point during the splatter-movie climax of Jakop Ahlbom’s ingenious tribute to horror cinema, the feeling emerges that literally anything could happen. Having seen bodies levitate and then vanish, a woman dissolve instantaneously, ghosts and revenants appear, disappear, be dismembered, climb through walls and television sets and float across the stage, it’s almost as if Ahlbom and his company have suspended the laws of physics, or conjured some genuine black magic on the stage. 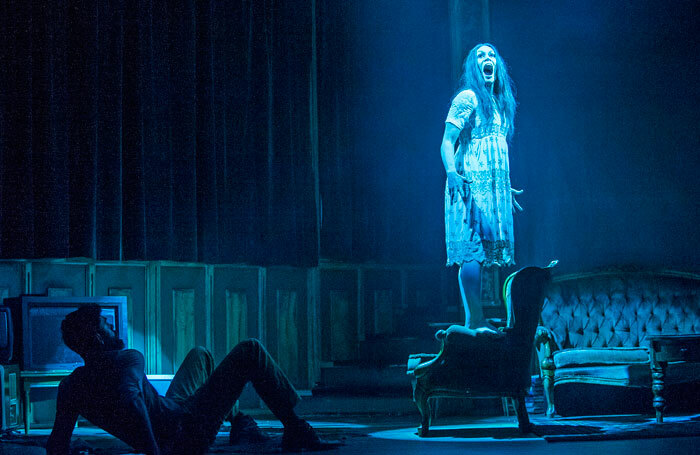 Horror is that all-too rare creation: a genuinely, persistently terrifying theatre show. Part of the London International Mime Festival, it’s a wordless 80-minute ghost train that plays homage to the greatest hits in horror history, while telling its own disturbing story of vengeful spirits and demonic possession. Framed around a classic cabin in the woods-style narrative, Horror sees three young friends foolishly staying the night in a crumbling old house. It’s no surprise that they fall victim to supernatural shenanigans, but the scale, complexity and bravura of the ensuing bloody mayhem is breath-taking. Tributes to Evil Dead 2, Ring, The Exorcist and Poltergeist surpass even the original films in their flawless execution, as Ahlbom’s established combination of grand illusion, dance and music creates shiver-inducing set-piece after set-piece. Subtle it ain’t, but it’s a fiendishly clever horror show that makes Ghost Stories seem crass and even The Woman in Black look like a leaden-footed museum piece. A black kaleidoscope of nerve-shredding entertainment. A superlative and nerve-shredding tribute to the greatest hits of horror cinema which blends dance and grand illusion.